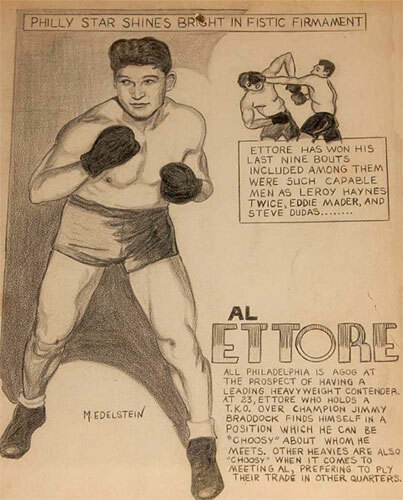 Heavyweight veteran Al Ettore of West Philly stopped a young Jersey Joe Walcott on this day in 1936. Walcott, the famous late bloomer, was a tender 22 years of age with a pro record of 11-1 (11 KOs) when he faced seasoned pro Ettore, 51-7-2 (17 KOs). The result of the bout was an 8th round KO for the Philadelphian. It would be another eleven years before Walcott would take his first try for the heavyweight title, and another four years after that until he would win it against Ezzard Charles. Ettore would go on to suffer a KO loss to Joe Louis later in 1936, before going 6-9-2 in the final two years of his career.